Silicon is expensive and complex to produce, requiring clean rooms and precise manufacturing techniques in plants that can cost billions of dollars. This means they are currently out of reach for low-cost products. But organic polymers, a class of substances that are used to make everything from bin bags to solar panels, could offer a solution. "It really opens up a whole new set of options for what you do with electronics," said Professor Art Ramirez of Bell Labs. 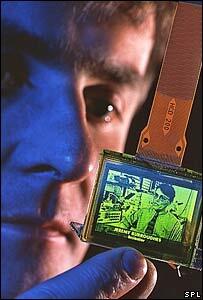 Highly conductive polymers were first discovered in the early 1960s and are already used in some electronic devices. In 2004, electronics giant Philips announced a concept flexible display, while other companies such as Cambridge Display Technology use them to manufacture organic light-emitting diodes (LEDs). Earlier this year, UK firm Plastic Logic said that it would build the world's first factory to produce plastic electronic circuits. Although, circuits made of polymers are much slower than silicon devices, they have one significant advantage: they can be printed using techniques similar to those used to mass produce magazines and wallpaper. "Using big drums of substrate you can put down one chemical after the other and build up something that looks like a circuit," said Professor Ramirez. This means they are cheap and easy to produce. And as the polymers can be printed onto flexible substrates they can also be used in totally new types of device, such as large-scale billboards or electronic newspapers. "If you can integrate that with very simple wireless connectivity one can imagine, instead of picking up the New York Times each morning, picking up a plastic sheet," said Professor Ramirez.